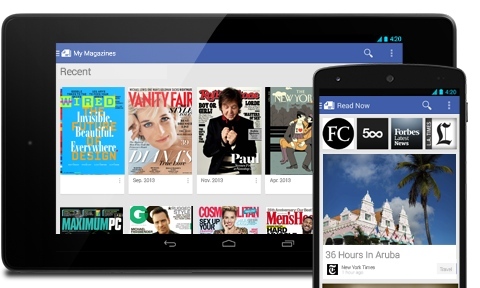 Android on Wednesday received its counterpart to Apple's own iOS Newsstand in the form of Google Play Newsstand, a news and magazine subscription hub that will also arrive on iPhone and iPad in 2014. 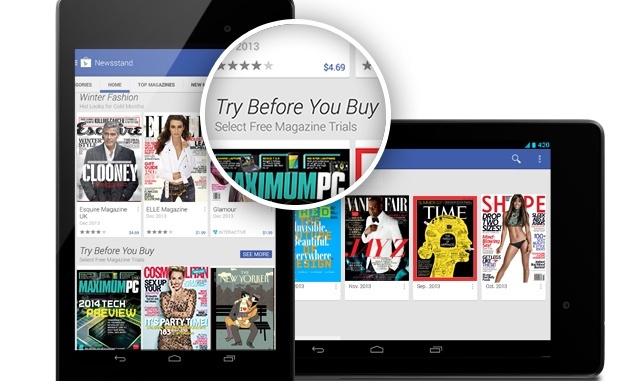 Like Apple's Newwstand for iOS, Google Play Newsstand allows users to subscribe to magazines and other publications that are all presented in one convenient place. But Google's offering goes one step further with the inclusion of its Currents service, offering a Flipboard-like presentation of the latest news from various Web sources. Newspapers are also included in Google Play Newsstand, including The New York Times, The Wall Street Journal and the Financial Times. Paid subscriptions are available, and many titles come with free 30-day trials. In all, Google says the Play Newsstand has about 1,900 free and paid publications, which also include titles like The New Yorker, Wired, and Vanity Fair. Google already has a dedicated Currents app for Apple's iOS platform, but a full-fledged Play Newsstand will be arriving on iOS in early 2014, the company has pledged. There, it will compete with Apple's own built-in Newsstand, which offers free and paid magazines and newspapers.